The first time I saw a three cent piece was in a box of old coins I inherited from my grandfather. It was silver, quite worn and seemed so very thin and fragile that I couldn't imagine that people had ever really used these as money. Being slightly smaller than a dime in diameter (14 mm vs. 17.9 mm for a dime) and much thinner would seem to have made this something all too easy to lose. The weight (.8 gram originally and then reduced to .75 gram) would also make it nearly unnoticeable should one fall out of your hand or slip through a tiny hole in your pocket. And yet, in spite of that, these coins actually were popular for a time and were widely used. We can see that from how many quite worn specimens exist today - search Ebay auctions and you'll find many well used 3 cent silver coins offered for sale. So why were they so popular? In the 1850's, a dollar had roughly the same purchasing power as $30.00 does today (seeMeasuringWorth.com). That means that one of these coins had only a bit less purchasing power than a dollar of today. Admittedly, that's not much, but it is enough for many small things, and that was also true then. For example, one of the things you could do for three cents in 1851 was to mail a half ounce letter. Prior to that, rates were higher - in 1844, it might have cost you nearly 15 cents. That reduction in cost was good news for people sending letters, but it also introduced a problem. You probably find pennies (technically "cents", pennies are British) annoying even today. In the 1850's they were even more so. They were large and clunky, weighing three times as much as now and having ten times the surface area. Being copper, they also tarnished and attracted dirt - they were not well liked. Worse, they were not legal tender. If you handed over three of those large cents as payment for something, you could be refused on those grounds. If you paid with a silver half dime (which was legal tender for debts up to $5.00), you'd get two clunky large cents back in change. Having a three cent coin made a lot of sense! Setting the silver content of coinage had been a bit of a problem. When silver rose in value, people would quite naturally hoard coins that were worth more than their face value. Coming into the 1850's, a 50 cent coin became worth 53 or 54 cents - obviously worth melting or at least saving. That created yet another problem for a person who wanted to mail a letter: would you hand over a half-dime or dime as payment when it was worth more than that in raw silver? Silver coins disappeared from circulation. 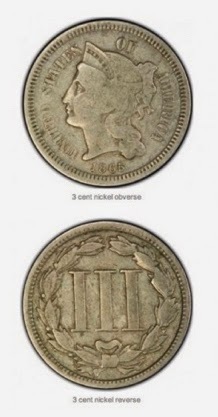 The silver three cent coin of 1851 was debased with enough copper (25% originally, reduced a few years later) to make it not worth hoarding while still having enough silver in it to be seen as having real value. This was later done with all silver coins, but the silver content was increased to 90% and the size was reduced to try to discourage hoarding and melting. This worked - for a while. The silver 3 cent coin was successful and saw plenty of use for postage and other needs. The U.S. Civil War caused hoarding to start up all over again and even the debased coinage was pulled out of circulation. There were paper money notes issued in three cent denominations, but people hated those also. Worse, in 1861, banks had suspended specie payment. That is, if you brought in paper currency or Demand Notes, they would not give you coins in exchange. That this made commerce difficult should be obvious. The somewhat unexpected acceptance of so-called "civil war tokens" made Congress realize that small coins didn't really need bullion value. They therefore authorized a nickel 3 cent piece and began minting these in 1865. These were accepted by the public and by merchants and were minted right up until 1889, when postage rose to 5 cents. You can find these 3 cent nickel pieces at reasonable prices. Many millions were made, so they are easy to find even in higher grade condition. These interesting pieces paved the way for the valueless (that is, no intrinsic value) coins we have today. See Trimes or Fish scales - the 3 cent silver coins also.